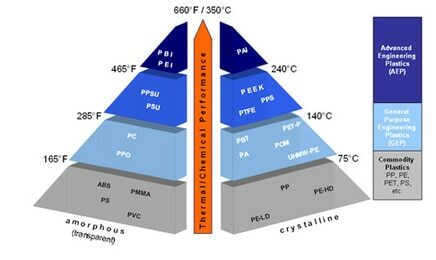 With the capabilities of high-performance engineering thermoplastics polymers increasing, and their scope of application broadening - particularly in the area of metal replacement - advice on polymer selection can be invaluable. Offering over 80 years of experience in the injection-molding of thermoplastics, Mitsubishi Chemical Advanced Materials views support in material selection as fundamental to its role as a creative partner. Support provided includes comprehensive information on material properties, processing behaviour and design requirements to enable “fit-for-purpose” material selection. The range of polymers processed by us include: polypropylenes (PP), polyethylenes (PE), nylons (PA), acetals (POM), polybutylene terephthalate (PBT), acrylonitrile butadiene styrene (ABS), PC (polycarbonate)/ABS/PMMA (Polymethyl methacrylate) blends, liquid crystal polymers (LCP), polyphenylene sulfide (PPS), polyether sulphone (PES), polyether ether ketone (PEEK) and Polyamid-imid (PAI - Torlon) all filled or unfilled, from the world's foremost materials suppliers.